Shop at our showroom to explore one of the biggest selections of hardwood flooring in the area. We have the right floor coverings to suit any home or business. Our floor store boasts an extensive inventory of flooring materials, including many engineered and solid hardwood flooring options. Countless name brands are in stock, providing you with a wide array different styles, colors, finishes, and grains to choose from. We are committed to providing the best floors for your property, as well as positive shopping experience. Let our staff member help you pick out the perfect hardwood floor for your renovation project’s design goals and budget. Hardwood flooring starts at $3.99 per square foot. Keep more money in your wallet by installing engineered hardwood flooring. If you want the luxurious look of wood flooring but do not believe it is within your budget, engineered hardwood is the perfect option for you. Not only do these hardwood floors help you save on your renovation project, but they are also highly environmentally friendly and resistant to moisture warping. Engineered floor planks are composed of several layers that are bonded together under extreme heat and pressure. Due to their unique construction, engineered planks are scuff-resistant and do not expand or contract under high humidity conditions. This means it works great in basements, bedrooms, dining areas, family rooms, and foyers. Learn more about the advantages of engineered planks by contacting our staff members or visiting our showroom. When you want timeless beauty throughout your home, install long-lasting solid hardwood flooring. 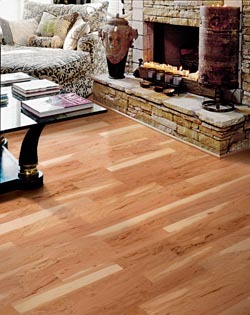 Solid hardwood planks are natural wood from top to bottom, giving your property genuine character. Since solid planks are thicker than other wood plank varieties, they can be sanded and re-finished many more times, extending their already long lifetime. The ability to re-stain or recoat your solid hardwood floors over and over makes it a smart investment for homeowners who want a floor that always look brand new. With the right care, your solid wood floor will look just as gorgeous as the day it was installed decades later. You can also take advantage of the plank thickness to change up your flooring’s style without having to install a new product. Whether you want something rustic, contemporary, traditional, Victorian, or subdued, you can redo your existing solid wood floors to give your home the right look. Find out more about the benefits of this flooring by speaking with our staff online, over the phone, or at our showroom. Hardwood floors have a well-earned reputation for creating exquisite aesthetics and boosting property value. Rooms with hardwood exude natural beauty and richness. Thanks to the diverse array of option available, it is easy to enhance the style of a room with wooden flooring based on your interior design theme and accent pieces. Whether you are renovating a formal guest bedroom or designing a casual living room, these floors are a great way to upgrade your space. We have samples of the top hardwood brands. Get your new flooring materials from a store that works with you from start to finish in order to produce amazing renovation results. It is our mission to make your flooring upgrade process enjoyable and successful. We pledge to provide you with a level of personalized service that is matched by any home improvement center or other flooring store – and to do everything in our power to earn your trust, business and recommendation to your friends. From choosing the hardwood flooring to selecting an installer, our staff members consult with you to ensure your every need is met. Our staff members are highly trained and have extensive knowledge of the many products we sell. Feel free to ask them for help finding the right product for your style preferences. They can help you consider which manufacturer and product best fits your design expectations and price range. Our showroom staff also has the design insight necessary to help you produce the right aesthetic effect with your new hardwood floors. Let us help you pick the most visually appealing finish, shade, and grain for your home. Professional hardwood flooring installation is available through our store at a discounted rate. We believe that expert installation should be done with the highest level of workmanship in order to protect your investment for many years. Choose our trained installers for a high-quality job that is guaranteed to look great and last long. Contact us for our showroom to speak with our staff about our hardwood flooring products and installation services. We proudly serve Lansing, Okemos, East Lansing, Holt, and Haslett, Michigan.